I can remember when liking Pinot Noir practically labeled you a weirdo. California Pinot Noir was an afterthought, a sorry substitute for Cabernet and Merlot. But now Pinot Noir is America’s Idol and has caught the favor of both serious and not-so-serious wine drinkers. The fact that it is a prima donna - touchy, difficult to grow, and notoriously fussy to work with - makes it all the more charming. The growing public appreciation of Pinot Noir has been fueled by the increase in the number of regions of the world producing this sensuous varietal, a striking rise in the number of excellent producers, and a remarkable increase in the overall quality and consistency in the bottle. 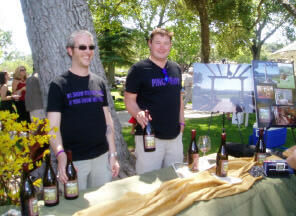 The growing number of pinotphiles have sought to share their passion through celebratory festivals. The first Pinot Noir celebration was launched twenty-one years ago in McMinnville, Oregon as the International Pinot Noir Celebration. Many others have followed, and in California alone this year I have attended 9 major events devoted solely to Pinot Noir. Every Pinot Noir growing region in California now has its own festival from Santa Rita Hills (Santa Barbara County) in the south to Anderson Valley (Mendocino County) in the north. Zinfandel and Rhone fanciers have one big event, Cabernet none. Pinot Noir celebrations are the perfect chance to rub elbows with winery owners, winemakers, and other Pinot geeks. Small boutique producers come alive and their wines are poured with gusto and pride. 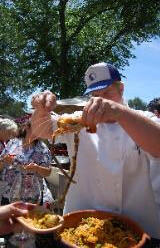 Chefs have become an integral part of these events as well, and the meals offered are strikingly good. Regional foods are paired with Pinot Noir and the bounty of the many dedicated farmers and winegrowers leads to much convivial revelry as attendees toast their good fortune. You cannot claim to be a true pinotphile if you haven’t attended at least one of these celebrations of Pinot Noir. In recent weeks I have been on the Pinot trail in California, attending four Pinot Noir events: Marin County Pinot Noir Celebration, Pinot & Paella, Wine & Fire, and Pinot Days. Sometimes when I think about all the great Pinot Noir I drank, I feel a little shame. Then I reflect on all of the passionate vineyard workers and winemakers and all of their hopes and dreams. I realize that it is more admirable to have drunk all this Pinot Noir and allow their dreams to come true then be selfish and worry about my liver. It is the least a prince can do. Here is a report of some memorable events and wines from a very happy, but saddle-worn, Pinot lover. The Marin County appellation has a long and colorful history of grape farming. Frenchman Jean Escalle established the red brick Escalle Winery in Larkspur and planted his land to grapes in the 1890s. 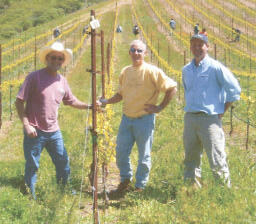 Escalle’s Marin County wine production exceeded 9,000 cases per year from his 23-acre hillside vineyard. Long-time Marin resident Helen Wilson recalled, “Escalle was a wonderful place. The French and Italians came here in droves on weekends to enjoy themselves. They brought their children and ate lunch. You could hear them singing all over town!” Today, the historic Escalle Winery serves as the venue for the annual Marin County Pinot Noir Celebration, this year held on Friday and Saturday, June 8 and 9, 2007. The event was organized by the Marin County Winegrowers Association and all proceeds benefited the Marin Agricultural Trust (MALT) which is an agricultural land preservation effort protecting 38,000 acres of Marin County land on 57 family farms and ranches. Marin County borders Sonoma to the north and the climate is similar to the Sonoma Coast. It is no surprise, then, that the area has sparked interest for Pinot Noir fanciers. The climate is influenced by two bodies of water - the Pacific Ocean along Marin’s western coast and the San Pablo Bay along the eastern border. 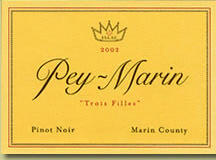 According to winegrower Jonathan Pey (Pey-Marin Vineyards & Mt. Tamalpais Vineyards), Marin’s winters are warmer than neighboring Napa and Sonoma because of extremely high winter precipitation. 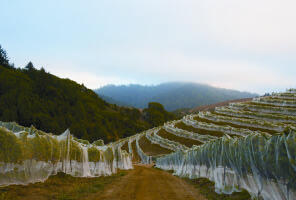 Subsequently, bud break is accelerated, but Marin’s persistently cool weather in the spring and summer and complete lack of heat waves push flowering, “set,” and harvest many weeks beyond the so-called “cool-climate” district of Carneros. The result is one of the longest natural “hang times” in the state. Because of the long growing season, wines from western Marin (Pinot Noir, Merlot and Riesling) have superb natural acidity and generally lower alcohol levels. The more inland areas of Marin County are warmer and more conducive to Bordeaux varieties. When nature cooperates, western Marin County can produce very small Pinot Noir berries that yield wild and concentrated flavors. Corda Vineyard (11 acres of Pinot Noir planted in 1990-1991 as part of the Chileno Valley Ranch, grapes sold to Pey- Marin, Vision Cellars, Thomas Fogerty and Precedent), Skywalker Ranch (a joint project of Niebaum-Coppola and George Lucas farmed by Mark Pasternak), Point Reyes Vineyard (a winery and B&B owned by the Doughty family with the only tasting room in Marin County), and Kendrick Johnson Vineyard (winegrower Stewart Johnson). The Marin Musketeers are seen in the photo (L to R: Mark, Jonathan, Stewart). Mark Pasternak has his hand in the farming of most every vineyard in Marin County. He has been producing grapes in Nicasio since 1980, and was the first person to plant a vineyard in West Marin since the Prohibition era of the 1920s. Early on, he sold his grapes for sparkling wines (Schramsberg and Kalin Cellars) and although he realized the quality of his Pinot Noir grapes were such that fine still wine could be made, he couldn’t even give them away! Dan Goldfield, the winemaker at La Crema at the time, had an interest in unique terroirs including cold-climate vineyards in the Sonoma Coast, and was happy to take the grapes. In 1991, he made Pinot Noir from the Devil’s Gulch Vineyard at La Crema, later at Hartford Court, and most recently since 2001 at Dutton-Goldfield. The success of Devil’s Gulch Pinot Noir established the quality of Pinot Noir grapes from Marin County and today, producers can sell every berry they produce. The Marin County appellation has meaning now for Pinot Noir lovers. Marin County will never become a large grape growing region. Water is scarce, coastal fog and the climate can prevent fruit ripening (ie vintage 2005), and available property for vineyards is scarce. Only large parcels are for sale and much too expensive for grape growers to exploit. Some winegrowers are turning to leasing plots of land on the large ranches. The 4th Marin County Pinot Noir Celebration was an intimate affair with 13 producers participating who are either located within Marin County or source grapes from the region. Artisan organic Marin-grown cheeses and breads were served along with some down-home barbecue featuring Mark Pasternak’s famous rabbit sausage (besides farming grapes, Mark also raises rabbits for many high-end California restaurants). Tasting impressions at the event follow. 13.64% alc., sold out, Stewart Johnson farms the Kendric Johnson Vineyard leased on land owned by the Corda family, and makes the wine from this 8.5 acre vineyard planted in 2002. Some grapes are sold to Miller Wine Works (below). Clones are 37, 115, 667, 777, 828, Pommard and Martini. Yields are ridiculously low (0.5 tons per acre in 2004). The wines are de-stemmed, cold soaked, inoculated with Assmanshausen yeast, and barreled into 33% new French oak for 18 months. · The 2004 is a nice offering featuring cherry driven aromas and flavors enhanced with tea, floral and woodsy notes. Lively acidity. Stewart also makes a fine Syrah from the Shenandoah Valley region of California. · The 2005 vintage was just bottled but oh my! Lovely aromatics of sandalwood and crushed cherries and terrific fruit which grows in your mouth. 14.7% alc., 133 cases, (sold out at winery). This was the first vintage of this wine vinified by Gary Miller. 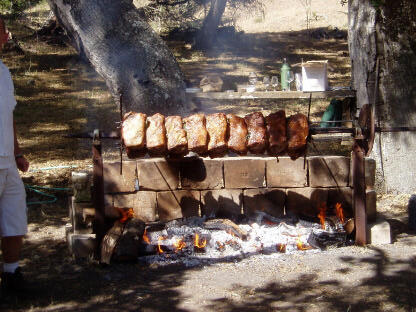 He was a professional chef for 12 years before becoming a winemaker in Napa Valley. He has worked for La Jota, Martinelli and Robert Biale wineries. Try fine wine retailers including www.hitimewine.net, or www.wine-searcher.com. 707-254-9727. The address is PO Box 3198, Napa, CA 94558. · Hi-tone cherry nose. Supple red fruits front and center with a side-car note of spice. The tannins are fine and the finish is as smooth as silk. Brilliantly crafted and one well worth seeking out. 14.1% alc.. This wine comes from the picturesque McNeil Vineyard situated high on a hillside above the town of Nicasio. The name Orogeny is derived from the Greek words oro (mountain) and geny (birth). The label is owned by Chalone and the winemaker is Dan Goldfield. There is also an Orogeny Pinot Noir from Green Valley ($36). Mark Pasternak feels the McNeil Vineyard in Nicasio has the potential to be a top source for Pinot Noir in Marin County. Yields have been miniscule to date disappointing Chalone who had hoped this would be a showcase vineyard with annual production of 3,000 cases. The winery is not open to the public. 1-877-254-4250. Look for the Orogeny wines in fine wine retail stores. · A decent Pinot Noir featuring sweet spicy fruit from start to finish. Moderate tannins on the finish need some time to integrate. 13.8% alc., 350 cases, $39. Jonathan and Susan Pey are the proprietors and winegrowers for both the Mount Tamalpais label (Merlot, Pinot Gris and Riesling) and Pey-Marin Pinot Noir. Their motto is clever: “Beaune in Marin.” Both of the Peys have an experienced background in the wine business and Jonathan seems to be particularly adept at bringing out the best expression of Pinot Noir that Marin County can offer. 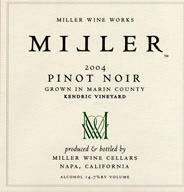 He produces classic Pinot Noir in all sense of the word, with finesse, balance and lively acidity. This wine is sourced from the Corda, Stubbs, and Kendric Vineyards. Most of the wine is sold to a faithful following on the mailing list (including myself). Www.marinwines.com, 415-455-9463. · Still young and just-released, this is a Pinot Noir of great promise. Exotic berry and spice notes compose a compelling aromatic profile and the assemblage of red and blue Pinot fruits is complimented by a bracing acid backbone. Like the name after which the wine is named (Trois Filles refers to the Pey’s three daughters), this is a classy feminine -styled Pinot Noir that is a perfect companion both before and during a fine meal. 13.6% alc., $30. The Doughty family farms 6 acres of Pinot Noir and Chardonnay in Point Reyes Station and produces an estate Pinot Noir in good years (2004). The 2002 Pinot Noir is from grapes grown at Stubbs Vineyard and was also poured last year. · A very light-bodied wine bordering on a rosé with nice floral notes in the nose. $60. I believe the first vintage for Andromeda was 2002 and most people are surprised to find out that Thackrey crafts a Pinot Noir. His Devil’s Gulch Vineyard Pinot Noir is like no other Marin County wine with more heft and alcohol than any other. Thackrey’s wines are sold through a few top wine retailers (use Thackrey’s wine finder feature on his website to locate) and to a mailing list. 40% of his wine is exported. The label at the right is for another of Thackrey’s wines, Orion, but the Andromeda label is very similar. · Hovering well over 15% alcohol, his Pinot Noir is heavy with thickly-layered dark fruit and a mouth coating finish. There are aromas and flavors here that defy description. Maybe some wooly mammoth or even pterodactyl. Loaded with teeth staining Pinot extract, it lends itself to sipping, much like a fine Port. 13.9% alc.. · A lighter styled Pinot Noir with a lot of charm. Appealing spice and ginger enhance the ripe cherry flavors. This winery was featured in detail in the PinotFile issue this year devoted to Pinot Paradise in the Santa Cruz Mountains. (Volume 6, Issue 21). The vineyard is a proven source of fine Pinot Noir, so this is a label to watch for. Precedent is the private label of Thomas Fogerty assistant winemaker Nathan Kandler. · These wines are still young and have not come together quite yet but there is good pinotosity in both. Wine industry veteran David Vergari crafts Pinot Noirs from purchased grapes in Sonoma and Marin counties. He brings years of winemaking experience in both Europe and Australia as well as California to his label begun in 2003. His full story is told in the PinotFile Volume 6, Issue 7. Vergari wines may be purchased by contacting David at 626-818- 8398. Look for his wines in fine retail stores and restaurants. · This barrel sample is delicate with nicely spiced red Pinot fruits. The texture is quite silky and the finish, although a touch hot, is clean and satisfying. 14.6% alc.. Previous vintages of this wine have been popular. Owner and winemaker Mac McDonald is one of the few African American winemakers in California. He sources grapes from multiple appellations including the Santa Lucia Highlands. The phone 707-887-1619. There is good retail distribution. · Very light in body, this wine is young and still disjointed with noticeable acid and heat on the backend. Dale Bartley is an accomplished home winemaker and wine geek living in San Rafael. He is well known for his homemade medal winning Pinot Noirs dating back to 1998 and his “Zin from Dale” which is quite good. His labels say, “It is this family’s deep devotion to drinking that has brought you this wine.” Dale is pictured right (black T) at the Marin County Pinot Noir Celebration helping to pour a little Pinot and handing out plenty of wine b.s..
For information on next years event, check the Marin Agricultural Land Trust website: www.malt.org. 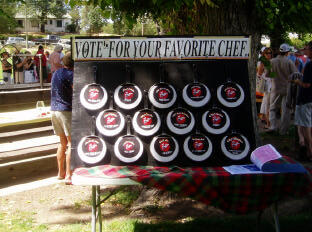 The 4th Annual Pinot and Paella Cook-Off was held June 11 at the Templeton Community Park in Templeton, California (just south of Paso Robles). 17 Pinot Noir producers were pouring and 15 chefs were cooking with all of the proceeds going to the Paso Robles Youth Arts Foundation. Most people consider Paso Robles to be blessed with a warm climate conducive to growing Rhone varietals, particularly Syrah, as well as Cabernet Sauvignon and Zinfandel. 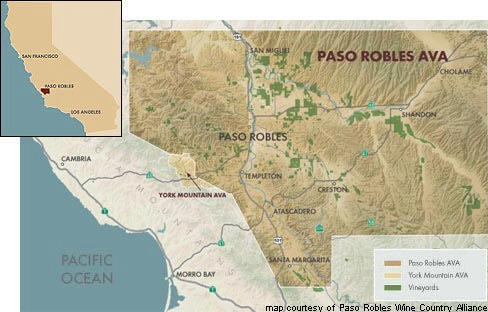 That is because they associate Paso Robles with “Paso East,” the vast and arid growing area east of Hwy 101 which runs through the town of Paso Robles. Here, the temperature can be quite warm during the day (it was 96° F the day of the Pinot & Paella event), but the evenings are cool and it is this diurnal shift that allows warmclimate varietals to thrive. “Paso West,” the 30 mile stretch of land west of Hwy 101 is quite different. 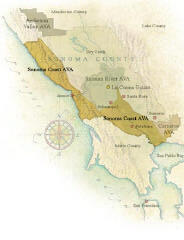 According to Matt Kramer in his book New California Wine (Kramer coined the terms “Paso East” and “Paso West”), Paso West is the recipient of maritime influence from the Pacific Ocean via the Templeton Gap, an opening in the Santa Lucia Mountains. Vineyards closer to this Gap and to the ocean are cooler. Also, the soils out west are quite different. Kramer notes that “It’s most extraordinary feature is soil. I’ve never seen, in California anyway, a wider swath of white calcareous soil than in Paso West.” The unique soil and cool ocean air act in tandem to provide a milieu conducive to growing Pinot Noir. Paso West is part of San Luis Obispo County. In the 1880s, the first signs of large-scale viticulture were found near the town of San Luis Obispo and more south in Templeton. According to Charles L. Sullivan (A Companion to California Wine), there were nine small wineries at that time and by 1900, there were about 1,000 acres of wine grapes in the county. The Hoffman family planted vines on their 1,200-acre property west of Paso Robles in 1964 and began producing Hoffman Mountain Ranch (HMR) wines, including Pinot Noir, in 1972. This coincided with the onset of the modern era of viticulture in Edna Valley, in the hills west of Paso Robles, and on the Estrella River Prairie to the east. The Hoffman Mountain Ranch Vineyard is one of the oldest Pinot Noir vineyards in California. The vines are 16 miles from the Pacific Ocean at an elevation of 1,700 feet in the southern Santa Lucia Mountains. The award-winning Pinot Noirs made there during the 1970s involved legendary winemaker Andre Tchelistcheff who consulted on the wines. 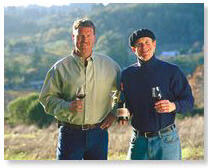 In 1994, Adelaida Cellars purchased a 400- acre parcel of the vineyard, including 32 acres of Pinot Noir. Considerable capital was invested in resurrecting the old vineyard and recent Adelaida HMR Pinot Noirs have won praise. There has been a proliferation of Pinot Noir vineyards in the Paso West area, a more than tenfold increase since Windward’s first vintage in 1993. Credible Pinot Noirs have appeared from a number of wineries and the presence of 17 producers at this year’s Pinot & Paella event testifies to the potential for this varietal in this unique microclimate. I still find a number of Pinot Noirs from this region rather rustic and earthy, sometimes leaning toward stewed flavors. Although several miss the mark, I have had a few good ones that bode well for future success. One nice feature of Paso Pinots is that the prices are sensible enough that they can be drunk regularly. The Pinot & Paella Cook-Off is a very casual affair, with samples of paella served on picnic tables, vintners pouring their wines under tented covers shaded by massive trees, and many smiling people just hanging out on folding chairs enjoying the afternoon. The crowd was primarily locals and everyone seemed to know everyone else. Because of the heat and the ongoing celebratory mood, serious tasting of Pinot Noir was not a priority. The idea was not to sell wine, but rather to enjoy wine. Paella is a good choice for a summer event for it shines best outdoors and practically everyone loves it. Although it is Spain’s most beloved dish, it can easily be adapted to California tastes by including local ingredients such as artichokes, fava beans, quail, sausage, cauliflower , and zucchini. Most Californians think seafood when the word paella is mentioned, but the original paella contained rabbit, snails, sometimes chicken, but never seafood. The word paella comes from the Latin patella, meaning shallow pan. The pan is critical, for it allows the dish to cook properly and it is perfectly suited to outdoor grills. The classic wine match for paella is a dry Spanish or Cotes de Provence Rosé. Rioja works well with a meaty paella and a white Rioja with a shellfish paella. Pinot Noir is not a classic match but its versatility makes it right at home with paella, particularly those Pinot Noirs made in a lighter Beaujolais style. The Celebrity Judges’ Award went to Chef Joe of Giaseppe’s in Pismo Beach, Most Creative Award to Chef Charlie of Catering by Chef Charlie, Chef’s Choice Award (tie) to chef Joe of Blue Moon Café and Chef Tom of Villa Creek, and the People’s Choice Award to Chef Dallas of 10th St Café. My favorite wines and producers at the event are detailed below. Asuncion Ridge Vineyard and Inn Philip Krumal and partner Michael Dilsaver own a unique vineyard and lodging high on a ridge overlooking the Pacific Ocean in Atascadero. 300 acres and a residence were purchased a few years ago. The residence was converted into an Inn consisting of three elegant suites furnished in Spanish-themed furniture from Mexico. A gourmet breakfast is served in the large kitchen/dining room or on one of the patios overlooking both ocean and mountain views. The Inn is only a 20-minute drive from the town of Atascadero, but it is like another world with exceptional beauty and tranquility. A 7-acre Pinot Noir vineyard has been planted adjacent to the Inn on a welldrained hillside at 2,200 feet. Several clones are planted including Pommard 4 and 5, 2A, 23, 667, 777 and HMR. Philip learned his winegrowing and winemaking from Marc Goldberg of Windward Vineyard. <100 cases, · Impressive for an inaugural effort with appealing elegance, racy red fruits, and supple tannins. This wine should be released within weeks and will be available from the website at www.asuncionridge.com or phone 805-461-0675. The 2006 vintage is coming along in barrel and will provide 400 cases. Philip says “the 2007 crop looks stunning and with newer vines, we should produce about 700 cases, even with extensive shoot and cluster thinning.” Philip’s pouring crew is shown below. Adelaida Cellars (see Hoffman Mountain Ranch, page 9). 14.2% alc., <900 cases, sold out. · This was really good and understandably sold out. An assertive Pinot nose of ripe fruit aromas was complimented by layers of fruit wrapped in mouth coating tannins. The current winemaker, Terry Culton, learned his trade at Wild Horse, Edmeades and Calera, and has modernized this winery’s whole operation. The wines show it (there was also a very credible 2006 Vin Gris of HMR Estate Pinot Noir poured). 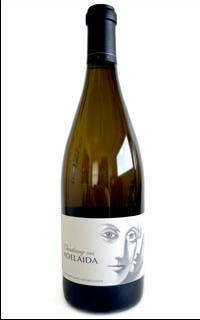 The wines are sold on the website at www.adelaida.com. 800-676-1232. 5805 Adelaida Road, Paso Robles, CA 93446. Castoro Cellars A very large producer (60,000 cases of multiple varietals) that farms 600 acres of vineyards (the website says 20,000 cases and 400 acres but the higher figures were told to me by the pourer at the event). Despite the size, this remains a down-to-earth operation. At the event, a single pourer had a couple of bottles of Pinot and a few business cards atop a barrel and that was it. The owners are Niels and Bimmer Udsen. Niels’ nickname is “Beaver.” While working in Italy, his friends called him “ll Castoro,” or beaver in Italian. The name stuck and the Castoro label sports a beaver and the tagline, “Dam Fine Wine.” The winemaking team here has been together for over 20 years: owner Niels Udsen, head winemaker Tom Myers, and assistant winemaker Michel Olsten. The wines are very fairly priced. 13.1% alc., $20. The Udesen’s purchased a local vineyard and when the opportunity to buy it arose, they acted in “blind faith.” · This was a very credible Pinot sporting the finesse and quaffability to perfectly compliment paella. Light in body and alcohol, yet with nice red fruit, spice and tea notes, this could be a perfectly fine daily drinker. Castoro Cellars winery is located at 6465 Von Dollen Road in San Miguel and is open to the public from 10-4 daily. 805-467-2002. The tasting room is at 1315 N Bethel Road in Templeton and is open from 11- 5:30 daily. 805-238-0725. The wines may be purchased on the website at www.castorocellars.com. A Bien Nacido Vineyard Pinot Noir is also available. Jack Creek Cellars Owners Doug and Sabrina Kruse are about as passionate about wine as anyone I know. A few years ago Doug sold his grain feed business in Southern California and bought the front 75 acres of the JRK Ranch in Templeton, 7 miles inland from the Pacific Ocean. The land is part of the York Mountain AVA and sits at the southern border of the Santa Lucia Mountain Range. 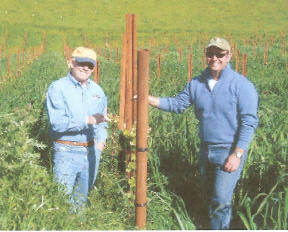 In 1997, Doug planted 20 acres to Pinot Noir (115, 2A, Pommard), 4 acres to Chardonnay, and a little to Syrah. 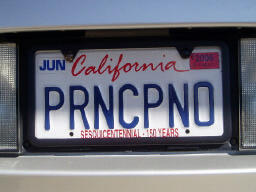 Recently, he has planted more Pinot Noir (828, 943), Syrah and some Grenache. The Krause’s plantationstyled home sits on the top of a hill overlooking the surrounding Kruse Vineyard. The modern winery and adjacent storage barn are tastefully positioned among the vineyards as well. Projected production is 2,500 to 3,000 cases of Pinot Noir, Chardonnay and Syrah. Doug is a burly, lumberjack-like figure and his wines reflect his appearance. He is the first to admit that he prefers a bigger style of Pinot Noir. (More information in PinotFile, Vol 6, Issue 5). $32. · Appealing aromatics of dark fruits, anise and clove. There is a substantial dark fruit core which is still overpowered by oak at this time. Even more structure and power here, syrah-like. Despite the prodigious fruit, the texture is silky and comforting. Not for the faint of heart. The wines may be purchased on the website at www.jackcreekcellars.com. Tasting is by appointment (805-226-8283). 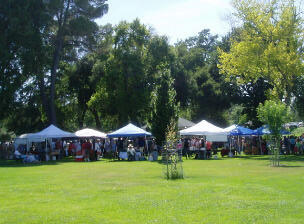 The winery and vineyard are located at 5265 Jack Creek Road, Templeton, CA 93446. Sylvester Vineyards & Winery This Paso Robles winery had its origins in the 1960s when Sylvester Feichtingel purchased the Rancho Robles which is now the current home of Sylvester Vineyards & Winery. The first grapes were planted in 1982 and the inaugural commercial wines appeared in 1990. This is a large operation with a modern winery capable of producing 50,000 cases of wine annually. 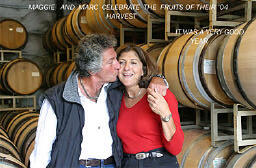 The winemaker is Jec Jacobs. $25. · The winery’s reserve label is Kiara. This was one of my favorite wines of the event. The most striking features were spice, particularly cinnamon, flavors, and a creamy, velveteen palate. 2,000 cases, $36. · A nice young French girl was pouring and this was appropriate as this wine was the most “Burgundian,” and the least New World at the event. There was noteworthy earthiness, minerality, and fecundity complimenting the red fruits in this wine. It was not as showy as several other Pinot Noirs that were poured, but it is built more for the long haul. A connoisseur’s Pinot. The vineyard is located at 1380 Live Oak Road, Paso Robles, CA 93446. Tasting room open daily 10:30-5. 805-239- 2565. The wines may be ordered online at www.windwardvineyard.com. A second bottling, the Windward Vineyard Barrel Select Gold ($60), is culled from the best 10 barrels in the cellar. Some older vintages are still available. Other producers at the event: Calcerous Winery, Carmody McKnight, Casa De Caballos, Cayucos Cellars, Hug Cellars, Pali and Loring Wine Co, Midnight Cellars, Opolo Vineyards, Red Head Ranch Winery, and Stephen’s Cellar. For more information on Paso Robles wineries on the internet: Paso Robles Wine Country Alliance, www.pasowine.com, and San Luis Obispo Vintner’s Association, www.slowine.com. 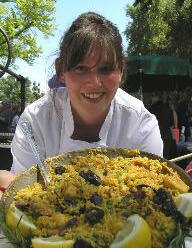 For information on next year’s Pinot and Paella Cook-Off, consult the event website at www.pinotandpaella.com. Elin McCoy recently wrote about fashionable high-octane wines at Bloomberg.com (July 12, 2007). McCoy points out that “High alcohol wines have a sweet, rich, thick character, but many also taste heavy, smell of prunes and raisins, and lack both subtlety and the savory freshness that makes the beverage great with food. There is a fashionable trend toward more concentrated, bolder-flavored wines that sacrifice balance for the allimportant first impression.” Much-admired wine retailer, Darrel Corti of Corti Brothers in Sacramento, California, has decided to no longer stock wines with alcohol over 14.5 percent. This decision created some angry and threatening responses to Corti on his website, but the reaction has generally been favorable indicating that wine drinkers are split on this issue. The “bigger is better” trend in North American Pinot Noir has divided American wine aficionados into two camps. A number of Pinot Noir lovers are former fans of bold-flavored Cabernets and Zins and their palate still veers toward the “Dark Side.” The wine press and several wine critics have fueled this fan base by awarding high scores to flashy, pumped-up and hedonistic Pinot Noirs. It is all a matter of taste, but I personally prefer my suits tailored to fit. Hungry for more? Adventures Along the Pinot Trail, Part II next week (Issue 33).